Soups have a special place in my heart - they can be as light or heavy as one chooses. As rich or as low cal as one pleases, and barring a few vegetables, most veggies lend themselves to a soup. As readers of this blog would know by now, I have over 30+ varieties of vegetarian soups (mostly vegan and practically all of them GF !). Ahem, anyways, I have a majority and we have a good time making and consuming them ! Let’s steer to the theme on hand - LowCalFoods was the theme for week #180 of the #FoodieMondayBloghop and this theme was suggested by our member, Sujata Roy. 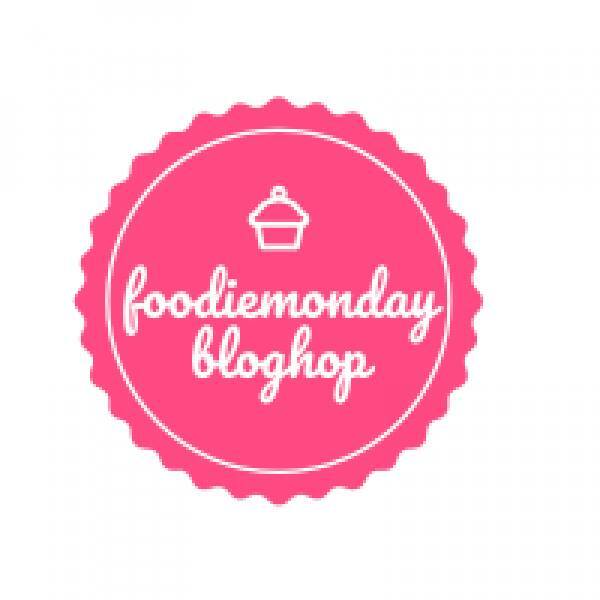 Sujata has a great blog encompassing many cuisines, delectable bakes and I am so glad she suggested this theme. I believe that some of the high-cal or high-fat dishes can definitely be converted into low cal ones and most of my experiments have been successful so far. In a soup pot / small pressure cooker, add the oil & saute onions till translucent, now add the salt, veggies and sauté for 3~4 mins. Add the veg stock or hot water and let it come to a rolling boil Pressure cook for 1 whistle (or in a soup pot) till the veggies are tender and al dente only. Add the spring onion greens, lemon juice and switch off. Enjoy it hot or warm. Hearty, warm and comforting - This is what I best describe this soup. I love lemon coriander soup, in fact all the broth based soups over the cream ones. Light and delicious. 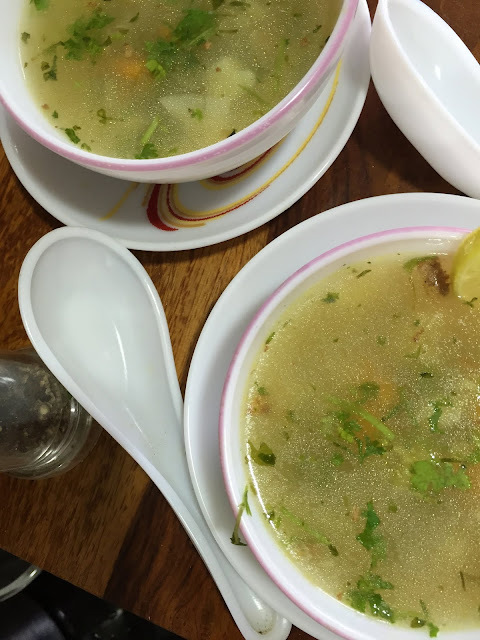 I adore lemon coriander soup, and slurp it up like no one's business whenever we get hold of a good one in restaurants we visit. Glad to see a healthy recipe for the same that I can easily recreate at home. Delicious looking soup..they are my weakness. I love it with a good bread. Haven't had a lemon and coriander soup so definitely bookmarking this one. I love Lemon Coriander Soup, it is so therapeutic when one is sick with cold cough and fever.Flavourful and so comforting!! Lovely share. Soups are my weakness and I can have them as mid day snack and even as replacement to dinner. Your lemon corriander soup looks very comforting and flavorful with an easy to follow recipe . Lemon coriander soup looks so comforting, healthy and delicious. I can imagine the aroma. Enjoyed it at restaurant but never tried at home. Thanks for the recipe. Perfect share for the theme. This Lemon and coriander soup looks so droolworthy.I have never tried this soup. Looks so tempting and perfect for the cold weather. I love the homemade lemon coriander soup because the one we eat at hotels seem to be devoid of veges. Looks very inviting. 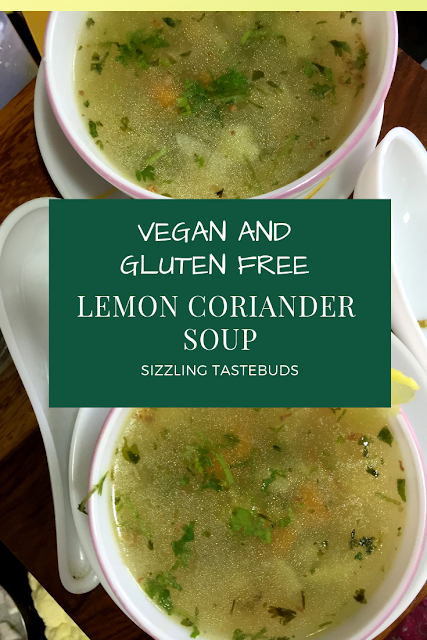 I often make coriander soup during this winter season with the fresh coriander leaves which are plentifully available The vegan version is a lovely addition as well !